I love seeing all the healthier cookie dough recipes around these days, made with chickpeas, almonds, oat flour, etc.! Because who doesn’t love cookie dough?? Now you can eat it without all the refined flours and sugars. Yesssss.The base of this recipe is the from the raw cookie dough bars I saw on Tasty Yummies. I used almond flour (meal) instead of almond milk pulp, cacao nibs instead of chocolate chips, and decided to make them into truffles coated in raw chocolate. Good decision I’d say😉 AND they actually taste like cookie dough! Probably more so if you used chocolate chips over cacao nibs, but either way – yum. Cookie dough (from Tasty Yummies) 1/4 cup softened coconut oil or vegan butter 1/3 cup maple syrup or agave 2 tablespoons coconut sugar/ brown sugar/ unrefined granulated sugar 2 teaspoons vanilla extract 1 1/2 cups almond flour (almond meal) pinch sea salt pinch baking soda 1/3 cup cacao nibs or vegan chocolate chips Raw chocolate (for coating) 1/2 cup melted cacao butter or coconut oil (I used 1/4 cup of each) 1/2 cup raw cacao powder 1/3 cup agave or maple syrup 1 teaspoon vanilla (optional) For the cookie dough:Whisk together the coconut oil, maple syrup, sugar and vanilla, until it’s combined and fluffy. Mix in the almond flour, salt and baking soda, then stir through the cacao nibs. Roll teaspoonfuls of dough into balls and place on a tray. Put them in the freezer for 5-10 minutes to firm up, which will make dipping them in the chocolate easier. For the chocolate: Melt the coconut oil in a small saucepan, then whisk in all the other ingredients until smooth and well combined. 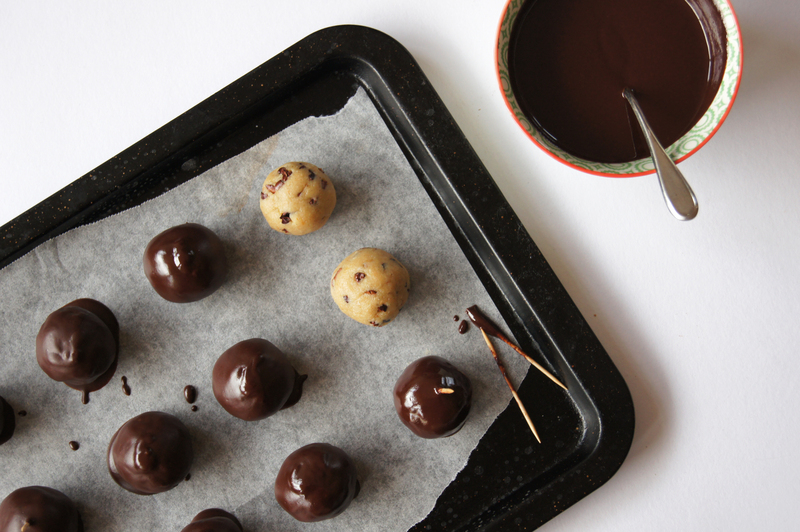 Using a toothpick, dip each ball into the chocolate then place back on the tray. (You can either leave the toothpick in or take it out after you’ve dipped it in chocolate). 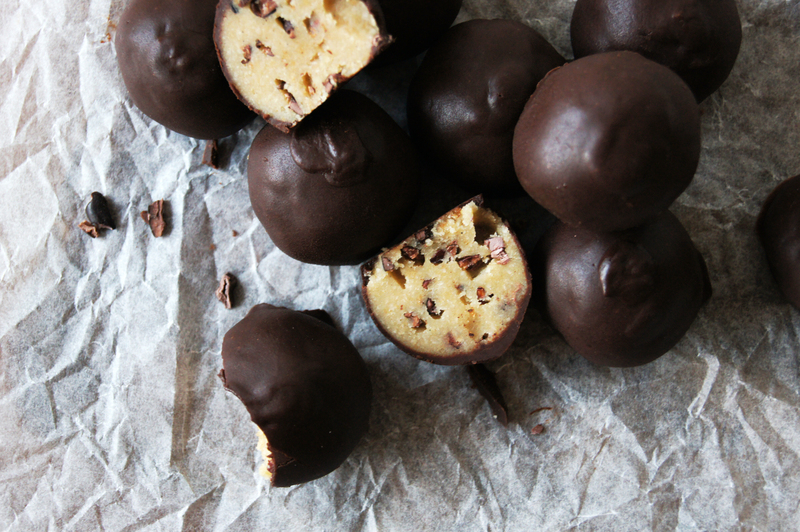 Put the truffles in the fridge or freezer until the chocolate is set.